Pearl pendant, single floating pearl Edison : very large pearl 13 x 24 mm baroque pearl Edison with a gold plated pendant, with or without a gold coloured high quality jewelry wire or with or without a noble 18 carat omega gold necklace on both sides to wear. 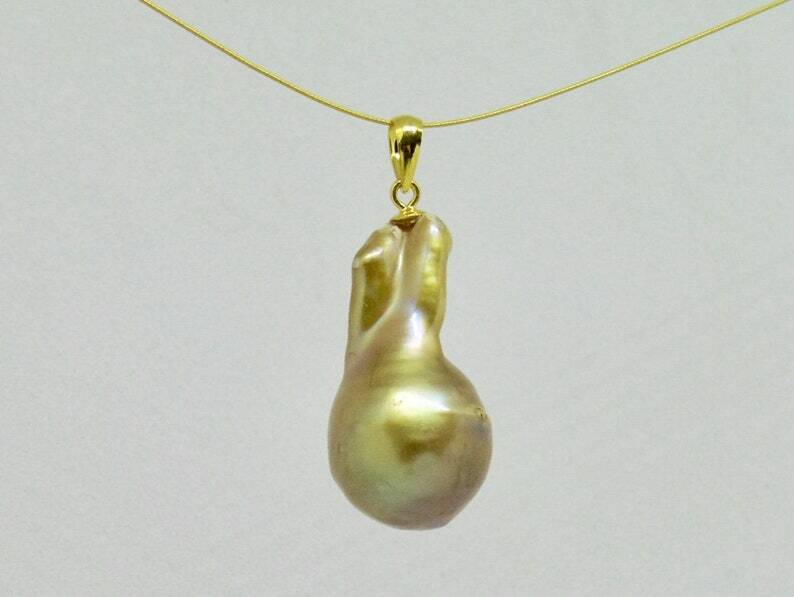 When you order, you will receive exactly this pearl, a special unique specimen with a metallic-golden shiny coating. The photo can hardly express its beauty. It was specially drilled as a pendant only from above, the lower half is undamaged. The surface of the whole pearl is interestingly shaped with very strong bronze metallic shine and very good smooth skin. This pendant will be delivered without chain. You can choose between 4 variants: without suspension, with gold-coloured jewellery wire, with silk ribbon or with a very fine genuine 750 gold Omega hoop of 1.2 mm diameter and 40 cm length, which is covered on one side with yellow gold, on the other side with white gold. This hoop is very sensitive and very valuable. It is thoroughly checked for intactness before shipment and cannot be returned in any case. The Edison pearls have been bred in China since about 2009 and were created by crossing the Japanese pearl mussel "Hyriopsis schlegeli" with the Chinese pearl mussel "Hyriopsis cumungi". The result is large, bulbous, round pearls whose luster and natural colors are incomparable to anything previous. Their name was dedicated to Thomas Alva Edison, who is still revered in China and Japan. These pearls are a completely new breed, it is their size and the metallic lustre that makes these natural products so unique. Only the most expensive pearls reach the round ideal shape, most have excesses and are then called fireball or flame ball pearls.